Are you (like us) in a bit of a Saturday lunch rut churning out the standard sad looking lacklustre sandwich? And in my world, serving lunch must be served at the greatest of speed in order that the kids (who have ravenous from all their different activities) don’t end up filling themselves on foods with no nutritional value whatsoever (Mum guilt again)! Plus if you have an aversion to sandwiches like me (honestly way too boring to class as a good meal), I never feel quite satisfied with my Saturday afternoon lunch. Recently, I’ve decided to change things up and whip up some of these savoury pancakes. The idea of pancakes for lunch got the kids super excited and even the clarification that they were in fact ‘savoury’ pancakes and therefore wouldn’t be served with the obligatory accompaniment of honey or berries, didn’t seem to dampen their sprits. I failed to mention the generous amount of vegetables I planned to include! And that’s the great thing about these pancakes – I have named mine Chilli, Tomato and Coriander pancakes but that’s because that is my favourite combination. Essentially, (and this is the best thing about this recipe) is that it allows you to use up any leftover veggies that you may have kicking around. Just chop them up finely, throw them in and away you go! I’ve included ideas for other vegetables you can use below, but essentially its any cooked vegetable that doesn’t have a high water content…. i.e. I wouldn’t recommend using cucumber or courgette. The pancakes come out lovely and crispy and kids love them (even with the veg)! Chillies are optional for the kids of course! And its definitely made Saturday lunch times a lot more interesting! Enjoy…. And let me know how you like them! Mix together the semolina, gram flour, plain yogurt and 150ml of water in a bowl. Stir well until there are no lumps remaining. The consistency should be around a pancake batter consistency. Leave to rest for 20-30 mins. While the batter is resting, prepare your vegetables as noted in the recipe. After 20-30 mins, stir the batter – you should see that it has thickened in consistency. Add the onion, pepper, tomato, coriander and chilli (if using) and stir through. Now add the salt and enough water to make a thick pancake batter (the batter should be slightly thicker then pouring consistency). Just before you are ready to fry the pancakes, add the lemon and baking soda at the same time and whisk through quickly. You should see the baking soda creating bubbles through the batter and this should provide light pancakes. Heat a frying pan with a little oil. When the oil is hot, spread evenly around the pan using a brush. Add ¾ of a large ladle of batter to the oil, using the ladle to draw out a circle. Ensure the pancake is not too thick. Place a lid on the pan for 30 seconds to allow the pancake to cook through. When the base is light brown, flip the pancake over carefully and allow to cook on the other side for a few mins until the pancake is golden. You can also flip the pancake a few times for even cooking. Place in a warming oven and repeat until your batter is complete. Serve warm with a chutney or spiced dahl. It has been a busy few months in the Sass & Spice world…. Primarily to do with that fact that I’ve been prepping and have recently taught my first course in Healthy Indian Cookery at the WI Cookery School. It was fantastic fun, although a little unnerving at the beginning! However, it was very rewarding to open people’s eyes to the fact that Indian food doesn’t have to be the greasy, heavy food that is often typical of curry houses. To help prepare for my course, I asked a few friends over so I could practice my teaching skills. It was a tremendous help and I felt much less stressed at the WI course. During the trial courses, I served this Jewelled Channa Chaat (Spicy Chickpea Salad) as a snack to replenish the cooks after doing a hard slog in the kitchen. I was surprised at how well it went down and a few asked for the recipe, so here it is. It completely keeps in line with my Healthy Indian theme too. The dish is very nutritious as it includes a variety of veg and the super pomegranate (full of vitamins not to mention the natural antioxidants) but so satisfying as it has so much flavour. Chaat, essentially is a loose term used in India to describe a multitude of savoury snacks. They are typically served on roadside or market stalls, where you will find the ingredients have all been prepped in advance. The dish is specifically made to order and its made up exactly the way you like it. The reason why the Chaat is made up fresh is because it isn’t something you can make and leave hanging around for very long – it is best eaten fresh. Most traditional Chaat’s I’ve tried have at least one element of fried food involved. Typical of my way, I’ve taken the best elements of the dish and added a healthy fresh twist to it so you can enjoy it guilt free. Its also very quick and easy to make-up (there is minimal cooking involved), using some basic pantry items and whatever veg you have lying around. Perfect for friends dropping by at short notice or great for an afternoon snack (served with the mandatory cup of hot chai)! Enjoy…… let me know how you like it. * Chaat spice (also known as Chaat Masala) is a key ingredient to a Chaat dish. It is a spice powder mix that can differ subtly by region in India but typically includes some unusual spices such as dried mango powder and asafetida as well as some of the more common spices such as cumin, coriander and ginger. You could make the full recipe from scratch but I have found very good versions in the supermarkets (such as Tesco and Morrisons) or you can get it in ethic stores. Prepare your chutneys in advance using the methods below. Peel and cut the potato down the middle and parboil with ½ tsp salt for 10 mins. Once cooked, cool the potatoes enough so you can cut them up into small cubes. Now fry up the potato in the butter and oil. Cook on a reasonably high heat so they are crispy on outside and soft in the middle. You could also roast in oven with a little oil if you didn’t want to shallow fry them. To prepare the dish (do this immediately before serving so the crackers and potatoes don’t get soggy), combine the chickpeas, potatoes, crackers, peppers, red onion, and half of the coriander chutney and chaat spice and mix well. Tip: It is best to add half of the chutney and chaat spice initially, taste, then add more as required. Spoon into a serving bowl. Chop the remaining coriander roughly and scatter on top with your pomegranate. You can also drizzle some of the remaining coriander chutney on top. Feel free to play around with the vegetables in this dish. I’ve used sweet potato and tomato in the pasts that have also worked well. Leaving a few stalks of coriander aside for garnish, in a food processor, whizz up the remaining coriander with the chilli and a splash of water until you get a smooth paste. Now, add a spoon full at time of the coriander mix to the yogurt until you get a spicy, tangy chutney. Don’t add all the coriander mix to the yogurt as it may end up too spicy. If using the dry tamarind, you will need to soak it with the required amount of water (as per instructions) until it becomes soft and mushy. Use a sieve to separate the liquid from the pulp, using a spoon to push out as much of the liquid as you can. Heat the oil on a high heat in a small pan and add cumin seeds. Cover with a lid, lower the heat and allow to fry until the seeds begin to pop. Add the strained tamrind pulp or tamarind paste, ginger, red chilli powder and enough water to create a thick paste. Stir through gently. Now add the jaggery/sugar and salt and allow to cook through for 4-5 mins. The mixture will thicken but you can add more water to loosen it. Once cooled it will be ready for use. Tip: Both chutneys freeze well so any remaining chutney can be frozen for use at a later date or it will keep in the fridge in an air tight jar for a few days. Ahhhh – officially the first day of summer and its torrential rain outside. You just have to love the irony of it, don’t you? I guess it wouldn’t be called an English summer without the guarantee of rain. In between the downpours, we’ve been making the most of the barbeque, which of course means on an onslaught of meat! Not sure if any of you have been feeling the effect of the all those burgers and sausages – ‘the meat bloat’ I call it. (No? Just me then. Clearly, I need to exercise a little more self-control)! So this dish was created as much from necessity to combat the over-indulgence as well as trying to make the most of the fresh produce currently bursting from the supermarkets. What better combination is there when you can make use of beautiful nutritious veggies that practically leave you feeling cleansed inside and out, yet still be able to make it all outdoors? Mr M categorically stated that that he would not be giving up the burgers for the veggies, but once presented with the colourful, fragrant dish, his senses took over and he found it hard to resist. The selection of vegetables that I chose to put together were simply based around what flavours I thought worked well together. I also looked to find vegetables that would be filling enough for a main meal. With the marinades, I hoped to enhance the flavours of the vegetables instead of covering them up. You could of course, change up the veggies or the marinades to suit your tastes. My favourite has to be the aubergine. The intense smoky flavour of the aubergine is bought to life through the paprika marinade and then finished off using the barbeque. Instead of the standard garlic, mayo combo often served with standard burgers, I used a caramalised onion hummus as the condiment which I found just bought the dish together. Not to mention that it ups the protein intake (making you feel fuller longer). When I created this dish, it was with the barbeque in mind, but it’s just as easy to do on a grill pan on a rainy day. Prep your barbeque ensuring it is clean. Prepare your vegetables by slicing the sweet potatoes, aubergine and onion into ½ cm slices. Try to keep the sizes as consistent as possible. Slice the pepper in half along the length and remove the stalk and core. Then slice ½ cm off the bottom and top so the pepper can lay flat. Mushrooms, peppers and tomatoes: lightly spray with olive oil spray, season with a little salt and pepper. Aside from the mushrooms and tomatoes, grill the vegetables on a medium to high heat, charring all the vegetables well and ensuring they are full cooked through. Brush with additional marinate left over during the cooking process. The onions make take a little longer, but cook these on indirect heat until they are soft. Once cooked, set aside to keep warm. Prep your veggie stack by piling the vegetables into your wholemeal rolls – to be honest, I place the grilled vegetables in the middle of the table and let everyone create their own! Don’t forget the hummus! Slice the onion into roughly ½ cm thick slices. Grill these on the barbeque with a little oil until brown and soft. Allow to cool, then lightly process them in your food processor until the onions are roughly chopped. Place aside for use later. Next, process the chickpeas and a little water in the food processor into a smooth paste. Add the crushed garlic, cumin and cayenne to the mixture and blend in the lemon juice and olive oil to taste. Now add the caramalised onions, mix through and finally season with salt and pepper to taste. Use as a condiment for the veggie stacks, or serve on the side with crudités or pitta bread. * The main hummus recipe has been taken directly from the ‘Leiths How to Cook’ book. The caramelised onion is an addition to the Leiths recipe. There are circumstances in life where, no matter how much you prepare, it is never enough (childbirth suddenly springs to mind)! Although not quite on the same level, my first week at Leiths has felt much this way. Having said that, I have loved every moment and left every day with a sense of complete satisfaction. The week has passed by in such a blur of activity; new people, new uniform, new knives (amazing), new kitchen, new methods and an insane amount of new information. I had no idea it was possible to fill three pages of an A4 pad with notes on how to prepare eggs! To be fair this covered boiling, poaching, scrambling, omelettes and custard – but still, three pages on eggs! Another day was spent on knife skills and I am still getting over the fact that it took a whole afternoon to chop a few carrots, onions and peppers to a uniform size. We did, however move on to pastry by the end of the week so I had something more then crudités to show for my week! I racked my brains for a recipe that would use the skills I had learnt this week. Mmmm… what to do with a plate of chopped vegetables? I can imagine you all rolling your eyes at the suggestion of vegetable soup, so lets move along swiftly. Instead, I thought I would share a recipe that was inspired by an informal meal we had on our recent trip to Toronto. As many of you will already know, the diversity in Toronto lends itself well to the food scene. During one lunch we tried Vietnamese sandwiches. I didn’t have any expectations as personally, I think of bread as a filler (I can hear bread lovers gasping in horror as you read this, as did Mr M). However, I was pleasantly surprised – the sandwich was filled with an abundance of fresh vegetables all wrapped in a freshly baked soft bun and finished with a tangy and mildly spiced dressing that bought out the flavours in the vegetables. The flavours worked so well together and left me feeling completely satisfied. 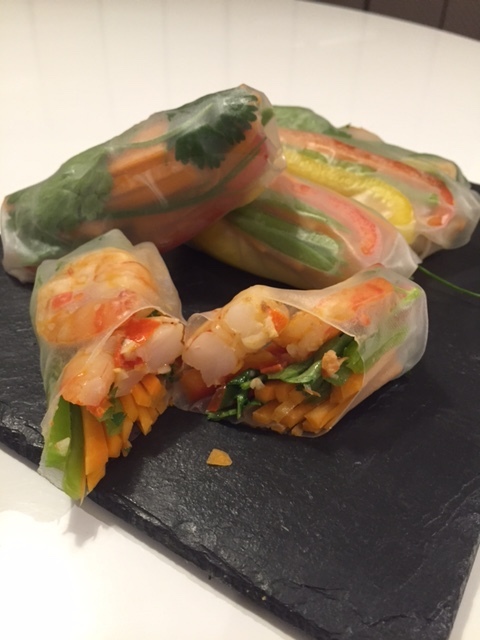 As my version uses rice paper instead of bread, I’ve added lightly stir-fried prawns to make up for the bread. Of course you can also make up with a fresh bread bun (like Mr M) or a wrap. A delicious way to enjoy your 5 a day! Try them out and please do let me know what you think. Place the carrots in a large bowl and add the combined ingredients. Have a taste and add more fish sauce and chilli based on your taste. Leave to marinate for 20 minutes.B’s tip: Marinating will infuse the spicy, tangy dressing directly into the carrots, so the roll/sandwich is not left soggy by adding the dressing after. Heat the oil in a wok at a medium heat and add the garlic and remaining chilli. Fry for 30 seconds, shaking the wok to move the chilli and garlic around so they don’t burn. Add the prawns just before the garlic turns brown. Stir-fry the prawns for 3-4 mins at a high heat or until the prawns turn pink. Once cooked through put aside to cool. Transfer to a cold bowl for quicker cooling time. If using the rice paper, place one sheet of rice paper at a time in a medium bowl of warm water until just softened. Carefully lift from water and place on a clean board. Place 2 sprigs of coriander and some chives in the centre of the rice paper. Top with the prawns and vegetables. Roll to enclose the filling, folding in sides after first complete turn of the roll. Repeat for remaining rolls.B’s tip: Only leave the rice roll in the warm water for a few seconds, pull from the water when the paper still feels somewhat solid. The paper will continue to soften as you place your fillings in the paper and should be completely soft by the time you are ready to wrap up the roll. If using bread or wraps, fill with prawns and vegetables till comfortably full. If there is any juice left from the carrot marinade, pour this onto the filling.